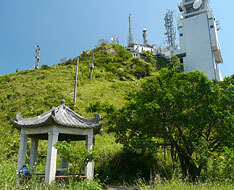 Castle Peak, at altitude of 583m, known as Pui To Shan in the past, is located in the west of Tuen Mun in New Territory. 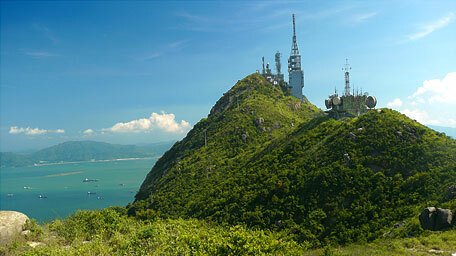 It is one of the three sharp peaks in Hong Kong. Start: Bus 60M, 263, 961 get off at Tuen Mun Railway Station. If Light Railway, at Tsing Wun Stn. 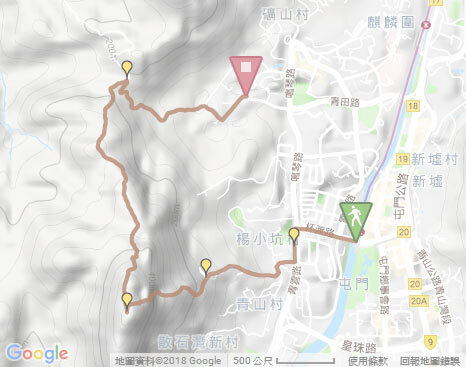 The later section from the top of Castle Peak to Leung King Estate is full of loose gravel, it would require clambering down. 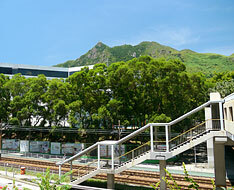 The trail starts from Exit B of Tuen Mun Railway Station. Along Pui To Road westward, turn left at the corner of Tsing Wun Road. Follow Tsing Wun Road towards south, then cross it (to the side with light rail) by taking the pedestrian bridge on the right. Passing through the bridge, turn left to go still along it. Afterward, make a right turn at the corner of Hing Choi Street. 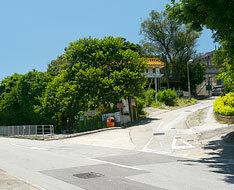 After joining Yeung Tsing Road, then turning left to go a bit, it arrives the entry of Tsing Shan Monastery Path on the right. 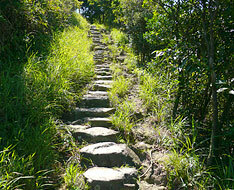 Follow the concrete path uphill, it gently ascends at the first leg. 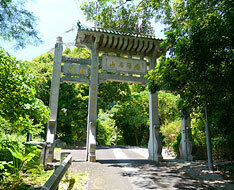 Beyond the decorated archway, it comes to the entrance of Tsing Shan Monastery on the right. Continuing on along the trail, take the side path on the left at the corner. Pass through the pavilion, trace the path on the left, and then follow the long and steep flight of steps on the right with a warning notice. 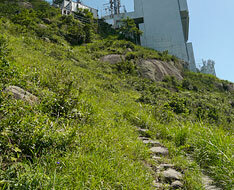 It winds along the hillside uphill with well paved steps at the initial section. 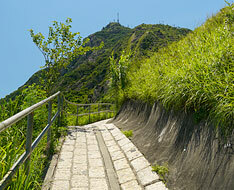 Up to the mid-level, the slope becomes gentle and you could overlook Tuen Mun as a reward. Further up, the trail becomes rough and more steep. 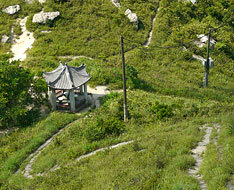 After steadily ascend, it leads to the pavilion near the top. Taking the side path on the left towards the transmission facilities, it pushes to the hilltop. You could feel mighty aura of Castle Peak which summit reaches for the cloud. 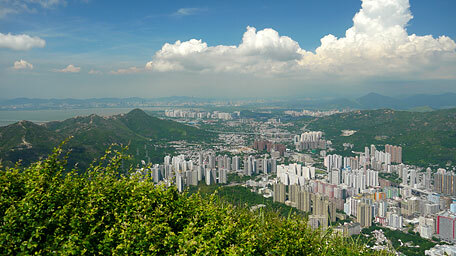 At the hilltop, it offers a grand view over Tuen Mun Town and Castle Peak Bay. Towards south in the distance, Lantau Peak and Sunset Peak of Lantau Island could be seen. 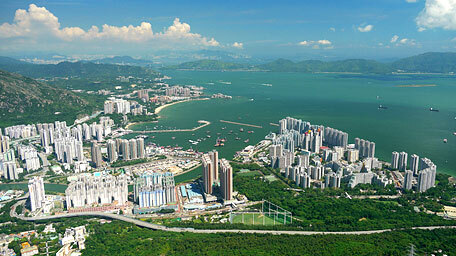 To the north, Tin Shui Wai and Shenzhen of China are also within sight. 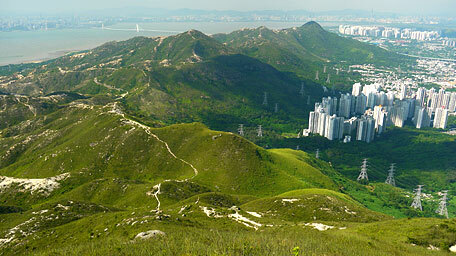 In additions, Hong Kong Island even peers out far at a very clear day. 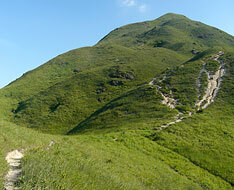 Retrace to the pavilion and take a rough path on the right front along the ridge towards north. Passing through another group of transmission facilities at the ridge, it comes to the crest of the knoll. 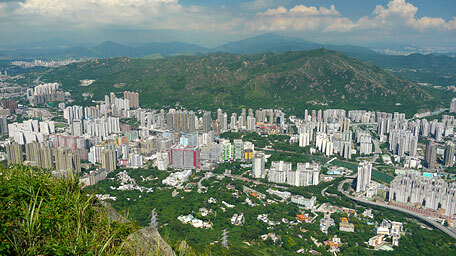 The range stretches northward from Castle Peak to Yuen Tau Shan. Overlooking westward, you could see a wide range of the denuded landscape - Castle Peak Basin, where was under firing range used by military and the granite rocks weathered and decomposed seriously, as a result it became badlands. 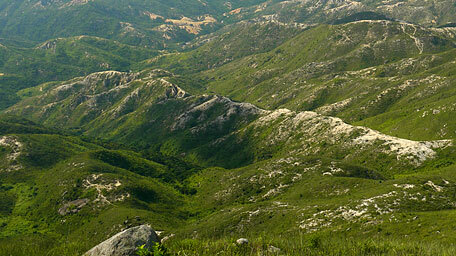 However, it gives a peculiar view over the criss-crossed ridges and gullies with sterile gravelly soil. 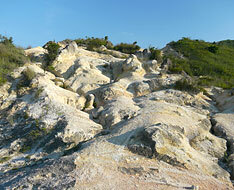 There are some famous scenic spots named from hikers such as, Canyon with shape of moon, Red Gullies with green pine. Continuing on along the trail downhill, it roughly follows the contours of the undulated ridge, and becomes steep and full of loose gravel in the later section. You might clamber down if required. 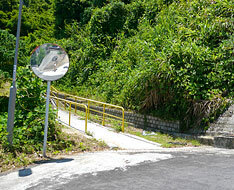 After descending to Leung King Au, join the concrete road to the right which leads you slowly down to Leung King Estate. 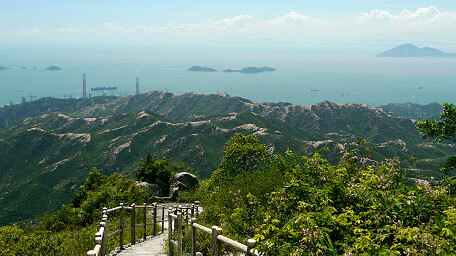 At the hilltop of Castle Peak, it offers splendid scenery around the place. 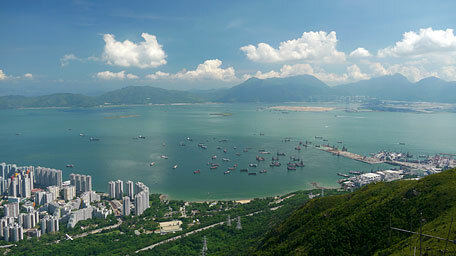 However, Nim Wan Landfill in large area could be clearly seen. 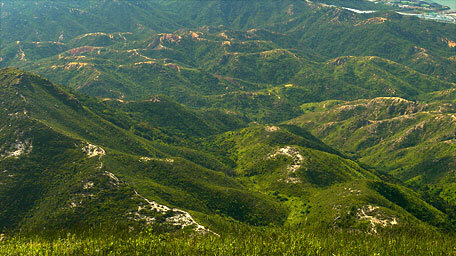 Actually, there were several landfills around Castle Peak in the past. 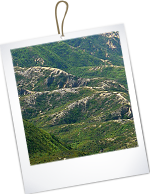 It is likely that the nature needs to pay for the cost of generating many rubbishes due to the modernization. Is it fair?